A.E.D. has been producing High Performance Streamline and Oval Tubing in house for a little over 5 years. The streamline tubing produced by A.E.D. is different then “Traditional Streamline”. Traditional streamline is produced by a cold drawn process where as our High Performance streamline is produced by a roll form process. Though the cold drawn process can produce streamline faster and in large quantities our roll forming process produces a more consistent and repeatable shape. This is due to our roll form process being a gentile consistent operation with fixed tooling. The dies used in the cold dawning process are not fixed and are redressed to make different sizes meaning there is not much consistency from batch to batch. The cold drawn process also has a greater variable in tolerance. 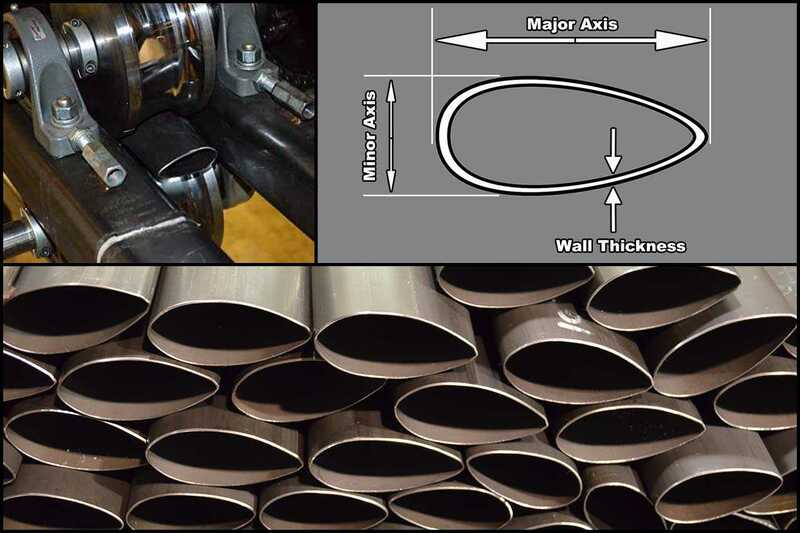 The roll form process also allows us more choices in the wall thickness as the streamline tubes maintains the same wall thickness as the parent round tube. Since we’ve acquired the tooling, Jason our “Fabricator”, has spent many hours perfecting process. In the beginning we were only able to produce a maximum length of 12’ of material. Jason has since made adjustments to the machines and built special guides that allows us to roll up full lengths of steel, aluminum, stainless or titanium tubing that only needs small adjustments, if any at all, in straightness. Under Jason’s lead, we have been able to improve the roll form process as well as the quality of Streamline and Oval Tubing. Click here to see all the sizes available.